Note: Tuition includes a manual. 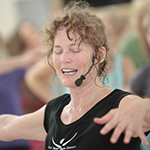 In order to receive a diploma, students must take Let Your Yoga Dance Teacher Training, Module 1, either before or after Special Populations training. Please complete and e-mail the health and training information form below prior to the program start date.